One piece of trivia: This is not just "a DigiTouch". 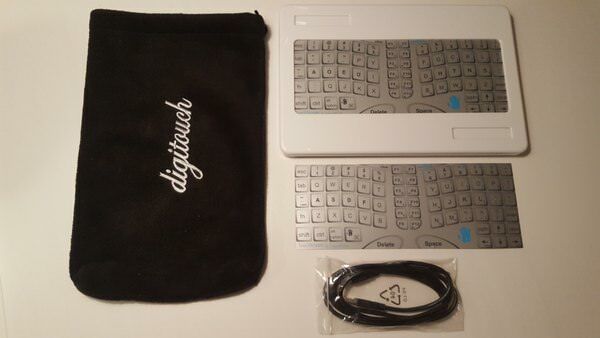 This is "the first DigiTouch": it's the first one they released, and the one I reviewed here on the site oh so many years ago. They sent it unassembled so I had the opportunity to take external and internal pictures of it before assembling it. Also, it came with two keyboard surfaces: US Qwerty and Dvorak. The Dvorak is presently installed but can be swapped with the US Qwerty if needed (yes, I carefully kept the spare surface). The whole device is basically in mint condition and has always been taken care of. The sensors test out 100% OK. It comes with a long USB cord, black fleece pouch with silver embroidered logo, and of course the spare surface. I have added a better non-slip backing that can easily be removed. Here's one photo -- this album has 5 photos.